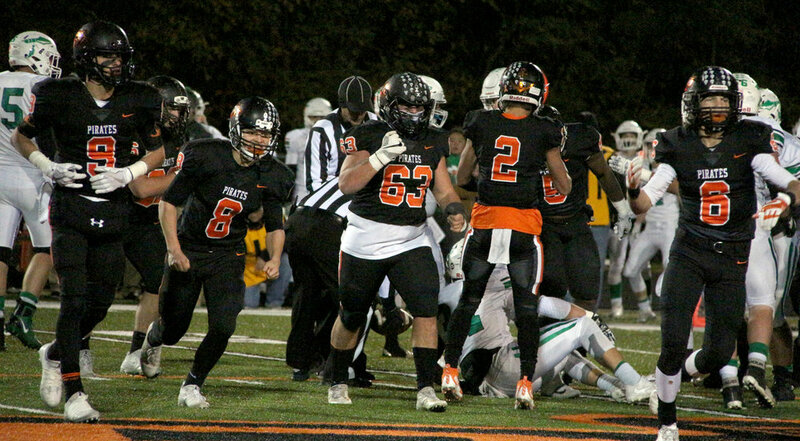 Platte County defenders Dylan Gilbert (9), Hunter Tongate (8), Sage Smart (63) and Nolan Saale (6) celebrate a stop in the second half of a Class 4 District 8 semifinal win over Smithville on Friday, Oct. 27 at Pirate Stadium. Platte County won 42-13. 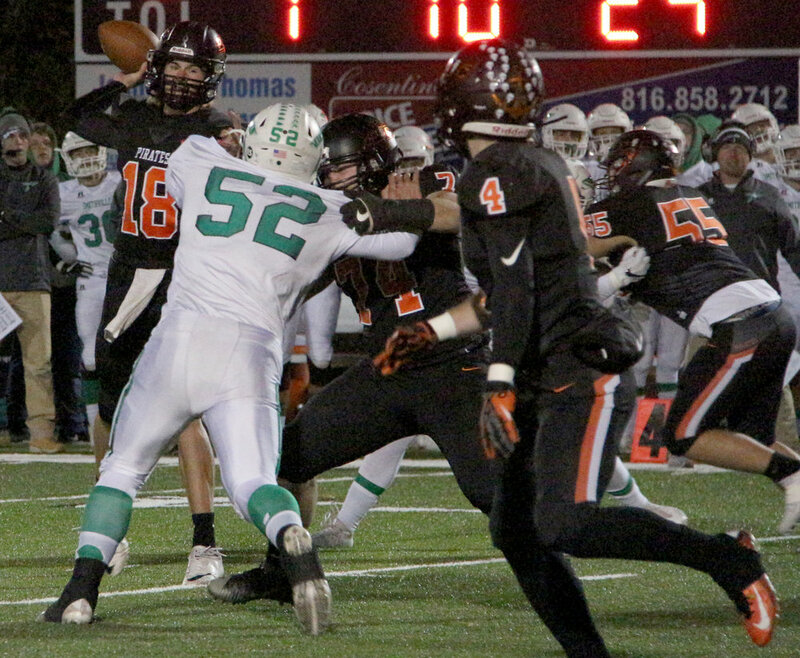 Sage Smart keeps himself at the center of Platte County’s defense. By design, the Platte County senior doesn’t make a ton of tackles, but he does take up space at his defensive tackle spot. The Pirates’ offense often outshines the defense, but Smart and the defensive line turned in their most dominant showing of the season Friday, Oct. 27 in a Class 4 District 8 semifinal. Platte County surrendered just 142 yards of offense in a 42-13 decimation of Smithville at Pirate Stadium. 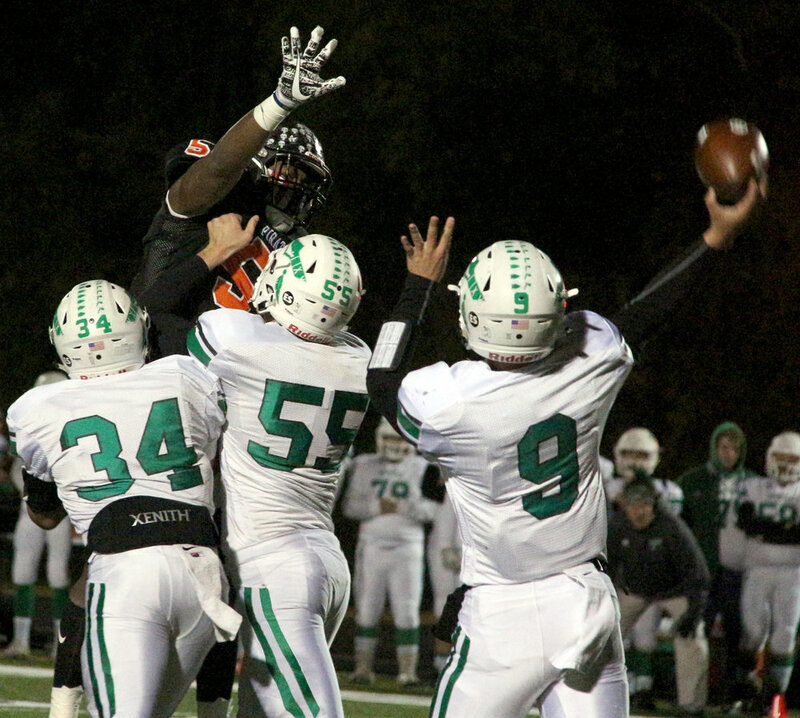 Platte County senior defensive end Michael Smith (5) fights through a double team to try and deflect a pass against Smithville on Friday, Oct. 27. Smart made 10 tackles in his most noticeable performance of the season. His return from early season injuries helped free up senior defensive end Michael Smith for his campaign at a record number of sacks (currently at 12½ after being held without one for the first time in eight games) on a defensive line unit now featuring senior Chase Blankenship at defensive end and sophomore Garret Watson at tackle. Smithville (9-2) managed just one first down before halftime and trailed 28-6 before gaining the second. Platte County built an early lead on a pair of touchdown receptions for junior wide receiver Dylan Gilbert and put the game away late with two more for senior wide receiver Devin Richardson. Tanner Clarkson — the first-year starting quarterback — finished with 221 yards passing and the four scores, taking over two school records in the process. Platte County senior quarterback Tanner Clarkson (18) looks to throw a pass to senior running back Gavin Hardman (4) against Smithville on Friday, Oct. 27. In what’s been a breakout senior year, Clarkson now has the most passing yards (2,731) and touchdown passes (34) for a season in Platte County history, passing James Valentine’s total of 2,711 from 2012 and Brandon Gutshall’s total of 30 from 2000. “The offense did some things, especially throwing the ball, we thought we could do,” Platte County coach Bill Utz said. “We’re blessed with a pretty good quarterback; we’re blessed with some receivers that catch balls. They made plays. Seeded second in a district bracket that featured five teams with winning records, Platte County (9-2) didn’t end up earning its coveted rematch but will play at least one more home game. 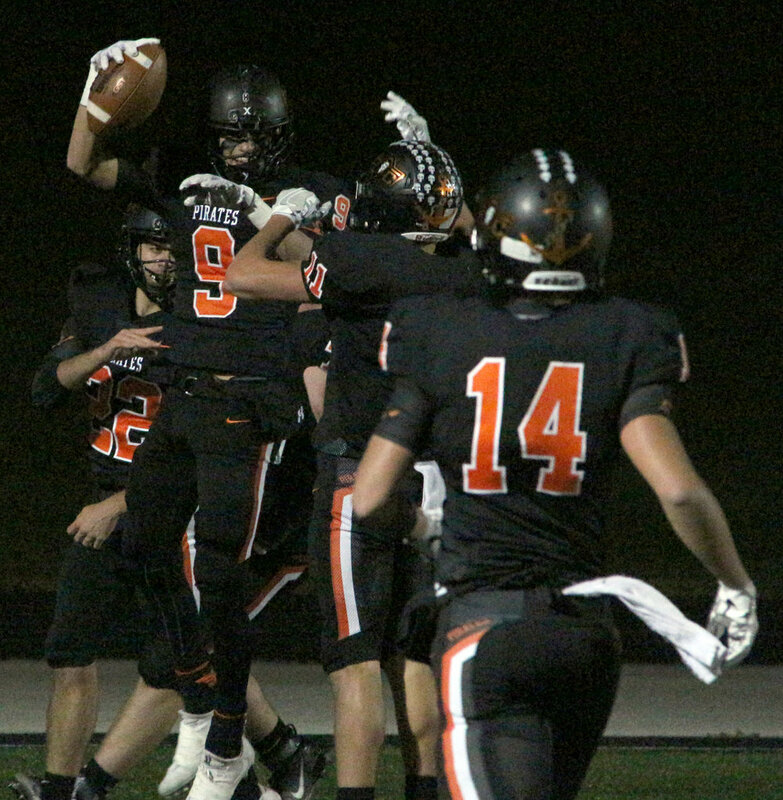 Platte County junior Dylan Gilbert (9) celebrates one of his two first half touchdowns in a Class 4 District 8 semifinal win over Smithville on Friday, Oct. 27 at Pirate Stadium. St. Joseph Lafayette (9-2) stunned top-seeded Kearney on the same night to end the Bulldogs’ three-year stranglehold on the Class 4 District 8 title. Instead of seeking to end a seven-game skid vs. Kearney, Platte County must find a way to contain Fighting Irish senior quarterback Diego Bernard, who accounted for all six touchdowns — including a pick-six with less than 2 minutes to go — in their upset of Kearney. In a confusing round robin of common opponent scores, Kearney beat Platte County 38-31, Lafayette beat Kearney 38-32, Smithville beat Lafayette 35-0 and Platte County beat Smithville 42-13. No. 4 seed Lafayette needed a late two-point conversion stop to win its district opener 35-34 over fifth-seeded Excelsior Springs. After the win over Smithville, Utz gathered his seniors to remind them of the opportunity to win a district title game after losing to Kearney in that round each of the past two seasons. Platte County junior Dylan Gilbert makes a touchdown catch in the first half against Smithville on Friday, Oct. 27. Platte County enters after finally controlling most of a first half, thanks in large part to two big defensive stands. Clarkson hit Gilbert for a 14-yard touchdown pass on a quick opening scoring drive that included a 36-yard completion to Richardson and a roughing the passer penalty. The Pirates were up 7-0 after 1 minute, 10 seconds and wouldn’t trail. However, a turnover and a long punt return offered a lifeline to Smithville. Platte County took its second possession in its own territory, and on the first play, a deflected pass ended up an interception, setting the Warriors up at the Pirates’ 15. Dakota Schmidt — a senior linebacker — jumped through the line untouched on a third-down sack to force a 40-yard field goal, which Ben Keesee hit. The next drive for Platte County ended after a 21-yard loss on a bad snap back to Clarkson. On the ensuing punt, Smithville’s Spencer Miller returned the ball to the Pirates’ 32. After giving up an initial first down, the defense held again, and Smithville settled for a 36-yard field goal to close within 7-6. The Warriors would finish the first half with more field goals (two) than first downs (one). Platte County senior safety Kobe Cummings pushes over a defender during a long first half punt return against Smithville on Friday, Oct. 27. Platte County needed just six plays to respond to the second field goal with Gilbert scoring on a 22-yard touchdown catch after breaking open in the middle of the field. After another Smithville three-and-out, Platte County senior safety Kobe Cummings broke off a video-game style 42-yard punt return, stiff-arming a Smithville defender on the home sideline and spinning his way to the Warriors 11. Pirates senior running back Gavin Hardman (team-high 52 yards rushing) scored on the next play to make it 21-6 — the lead taken into halftime. Clarkson took a costly sack on each of Platte County’s final two drives of the first half to prevent more points, but the Pirates scored on three of four possessions in the second half. After forcing a three-and-out on the opening possession of the third quarter, Platte County drove 66 yards on seven plays with Schmidt — serving as an occasional fullback — plowing into the end zone from 1 yard out for his second rushing and third total touchdown of the season. Up 28-6, the Pirates were in total control until Clarkson’s second interception led to Smithville’s best possession of the night. Platte County senior Dakota Schmidt (28) tosses the ball to a referee after scoring a rushing touchdown in the second half of a Class 4 District 8 semifinal win over Smithville on Friday, Oct. 27 at Pirate Stadium. Smithville went 64 yards in 11 plays with a combination of runs from Isaac Miller (28 carries, 97 yards) and three Platte County penalties. On the first play of the fourth quarter, Miller threw a 17-yard touchdown on a halfback pass to tight end Jake Fisher to make it 28-13. Platte County recovered an attempted onside kick and ate up nearly 6 minutes on a touchdown drive to answer, capped with a tough 3-yard catch for Richardson at the left pylon on a third-and-goal play. Smithville fumbled on its next play, Cummings ripping the ball and out and Schmidt recovering for Platte County. Richardson caught a 24-yard touchdown pass on the next play to finish up the scoring. Platte County junior running back Adel Freitek runs over a Smithville defender Friday, Oct. 27 at Pirate Stadium. While many expected a quick rematch with Kearney, Lafayette will present its own unique issues, and Platte County’s players want to avoid any kind of mental letdown while in pursuit of big goals. Platte County adjusted on the fly again with 6-foot-4 senior John Watts held without a catch for the first time in his two seasons while facing constant double teams. Richardson finished with team-highs of seven catches for 111 yards, while Gilbert added five for 86 as the main targets for Clarkson. After entering the season with one career catch, Richardson now has at least one touchdown in nine of the 10 games he’s played with two or more in three of those. An offseason spent starring for Platte County’s track team helped Richardson develop into a key threat for a multi-faceted receiving corps. His 896 receiving yards already ranks as the fourth-best single season total in program history. “I don’t even want to say three-headed monster. It’s like a five-headed monster,” Utz said. “We kind of knew what he had, but at the same time, he came in and made plays right from the get-go. I’m going to put a lot of that on him, working out and getting in shape and running track. Platte County ended up running for only 56 yards, partially due to the losses on the bad snap and the four sacks taken. The pass game will likely be a focus again against Lafayette, which tends to give up points but also score big in wins. The Irish have scored just 12 points combined in their losses to Smithville (35-0) and Maryville (14-12). While Platte County’s playoff drought dates back to 2012, Lafayette enters off the program’s biggest win in decades, looking to spring another upset and reach the Class 4 quarterfinals for the first time since 1992. The two former Midland Empire Conference rivals have not met since 2011, and Platte County holds a 15-1 all-time record in the series. Lafayette’s lone win came back in 1964 (19-6).